View Video: "The Legal File". Mr. Gottlieb was a featured panelist in a roundtable discussion on mediation carried on Public Access Television. December 11, 2008. 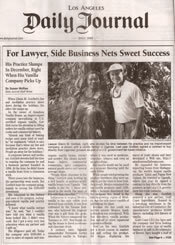 Glenn Gottlieb was featured in The Daily Journal of Los Angeles in an article titled "For Lawyer, Side Business Nets Sweet Success".